Visual people are drawn to visual platforms, and with over 800,000,000 Instagram users worldwide, hairdressing is high on the list of industries that this sharing site serves. 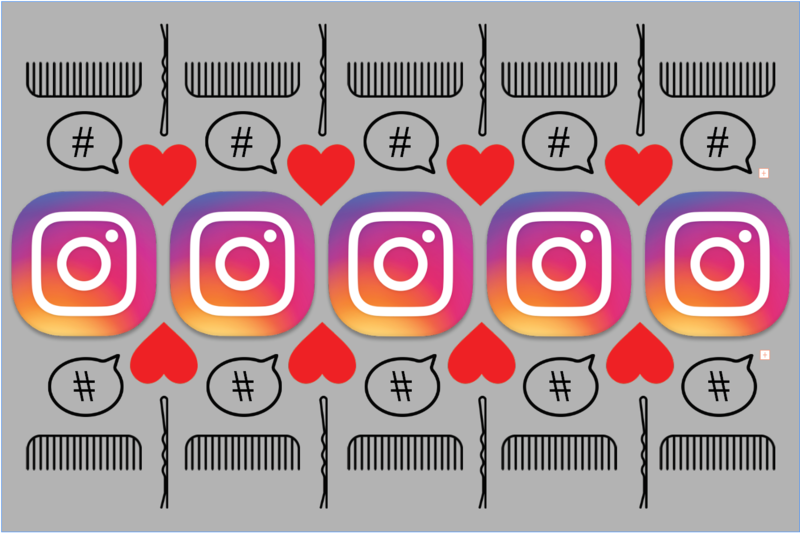 So, how do you use Instagram to market yourself as a hairdresser? Well, it depends on what your goals are. Do you aspire to a global celebrity or are you just looking to put a few more butts (and heads) in your chair? In any case, the audience is there; you just have to reach them. • The Instagram user averages between 18 and 29 years old. • 6 in 10 adults globally have an Instagram account. • 40 billion photos have been posted since its inception in 2010. • 60% of users say they discovered a service or product on Instagram. • 300,000,000 people use the Stories feature. • The best time to post is 5:00 pm on Wednesday. • Who do I want to connect with? Other hairdressers? Clients? New clients? • How far does my reach need to be? • What kind of work do I want to do on a daily basis? • What kind of work do I want to be known for? Know your goals and know your audience. If you’re going to do any sort of branding on social media, do something that you’re passionate about, and what makes you unique to everyone else. Your posts needn’t be limited to your own work, says Jayne. “Fashion, art, design, nature – whatever feeds your creativity is going to inspire your followers as well as those who might become followers,” says Jayne, who also condones posting other hairdressers’ work. “If you want to repost a picture that inspires you, put it out there honestly and say that you want to do more hair like that.” Just be sure to give credit where credit is due. Rob is about to launch a 12-day giveaway leading up to Christmas. “I've created 12 Christmas-themed cartoon friends with numbers inside, so I can do the countdown like an advent calendar,” he explains. “There’s an image of the prize for the day, free products, free haircuts, 50% off color, things that people really want. When you tag a bestie, you both have a chance of getting a free haircut. My hope is that it’s going to be something that people are going to talk about and potentially exponentially grow our social media reach. A hashtag is a word or phrase preceded by a hash mark (#) used within a message to identify a keyword or topic of interest and facilitate a search for it. Whenever a user adds a hashtag to their post, it’s able to be indexed by the social network and becomes searchable/discoverable by other users. Although Instagram allows up to 30 hashtags per post, Cyd Charisse (@cydcharisse), hairdresser and founder of Destroy the Hairdresser recommends using “3 to 5 well-considered hashtags to avoid getting shadowbanned.” Shadowbanning is the act of blocking content without you knowing it. It targets users who display spammy or inappropriate behavior whose content won't appear on anyone’s feed unless they already follow them. Some people like to put their hashtags in a comment after the post is live because they think it looks cleaner, but this is a case where function trumps form. The Instagram algorithm goes to work instantaneously, and hashtags added even a few seconds later are useless. A geotag is a fancy word for adding your location to a post. But, think beyond simply identifying your city or neighborhood. Tagging nearby features that people might search for can expand your reach and attract new followers. Say there’s a popular gym nearby. Create a post about quick post-workout styling tips and tag the gym. Or tag a music venue on a post about rock-inspired haircuts. Do this when you travel, not just where you are based. Most of us assume that the grid (your static feed) rules. But Stories are gaining ground and growing 15 times faster than old-fashioned feeds. Stories aren’t necessarily meant to be “shared” or “liked” in the same way as a traditional post, and besides avoiding the popularity contest of social media, it can less serious, more spontaneous. Stories aren’t necessarily meant to be “shared” or “liked” in the same way as a traditional post, and besides avoiding the popularity contest of social media, it can less serious, more spontaneous. Some people find the 15-second time limit frustrating, but others enjoy the discipline in message-making. But if you have longer stories to tell, apps like Cutstory offer a workaround by breaking down videos into 15-second segments and posting them together for you. Even though stories are ephemeral by design and only last 24 hours, you have the option to save them permanently to your Highlights. This can serve as a bulletin board for the content you want people to refer to constantly – either creatively or practically – and can be an informative part of your profile. In terms of taking photos, it’s the same mantra as doing hair: Practice, practice, practice. Do models for free and take the time to learn how to shoot them. “Photography is not second nature to hairdressers; it takes time, like anything does, to learn,” says Jayne, who recommends investing some time each week. Take your time to organize the haircut in a way that shows off its best qualities! Then take a lot of photos – you never know which one will be the best one. Lighting is key! Test shots in 10 different spots: Inside; outside; in the shade; in the sun, and compare them all. This tells you where your warm light is, your cool light is, where hair is going look more blue, green or pink. And speaking of haircolor, hands off the filters and photo editing tools to avoid creating unrealistic images and expectations you can’t fulfill in reality for clients. The captions that accompany posts are often an afterthought. That’s a mistake, because captions may be the single biggest factor in determining a post’s success or failure of a post. If you’re like most people, you describe what’s in the image. The key is explaining why the image matters instead of what it is. Use your caption to give people an additional reason to like, share or comment. Tell them something they can’t see in the picture. Share a backstory, a lesson, or explain why you’re posting it in the first place. The image matters to you, obviously, but explain why it should matter to them. Switch from a regular Instagram Profile to a Business Profile to provide a direct contact method within the app. With a business profile, a few contact buttons appear to allow customers to get your address, call the salon, email you or even book an appointment. Additionally, you get analytics on your profile to gauge your reach and engagement. The more you engage with other people’s profiles and respond to comments left on your posts, the more you’ll see engagement build. And engagement (conversations in comments) is the metric that matters more than likes alone. When someone leaves a comment, make sure you respond. You want to demonstrate that your Instagram site is a spot where customers can interact with you and your brand. Followers want to get to know the person behind the brand, and it’s important to make an emotional connection. Followers want to get to know the person behind the brand, and it’s important to make an emotional connection. Schedule unlimited Instagram photos, videos and albums, for free. Drag and drop to rearrange the order of your posts. Repost your favorite Instagram content. Import a long video, and CutStory will cut it up and save it in your smartphone’s camera roll as fragments of 15 seconds or any other length. Software that provides social media management dedicated to monitoring, analytics, and audience engagement which can be equally useful to small, medium, and large businesses from all industries. The all-in-one app for visual planning, data-driven insights and publishing capabilities for digital content. Features focus on visual scheduling, media management, marketing, and analytics. A photo collage app only available on IOS devices to add layers, crop images, add effects, shapes, and type. A mobile photo-editing toolkit that includes filters, color correction, borders, overlays, and textures. The Halfrican (@_thehalfrican) uses her bio to proclaim her focus as “Hair Colorist and Curl Whisperer.” The page delivers just that. Jayne Matthews (@jayne_edosalon) is all about creating effortless hair and has built a cult following by posting her work and what inspires her to create that work. Brigitte Russell (@hairbybrigitte) uses her Stories Highlights to not only show her color and extensions work but also to inform her clients about pre-booking and her favorite products. Barber Below (@barberbelow) is all about being true to yourself and knowing your audience. The shop is a safe space devoted to queer identity. The feed is voyeuristic, funny and catered to their audience and clients and often features them. Cyd Charisse (@cydcharisse) not only posts beautiful images of her work as hairdresser, educator, and business coach with Destroy the Hairdresser but also uses geotags not only to let people know where she is but also to attract a new audience searching those locations.